The hotel lobby furniture may exert significant pressure on the fibers of the carpets, which may compress them. This problem is more expedient in frieze and plush carpeting. Inappropriate padding may also cause crushing and matting. Lack of timely maintenance is the main reason behind this type of carpet crushing and matting problem. Flattened carpet pile requires professional carpet cleaning to revive it and specialized technicians may use pile lifting technique to remove the dirt and restore the carpets. Heavy furniture causes depression and indentations on the commercial carpets. Try to re-position the furniture of the lobby every now and vacuum the area under the furniture legs too. You may also place glides beneath furniture legs. However, if the depression cannot be restored by ordinary vacuuming, you will have to contact carpet cleaning professionals to tackle this issue. This problem is faced by all commercial carpeted industries because of the public access zones. People keep bringing in the dust and dirt through their shoes and dislodge it in the carpeted flooring. Dust accumulates over time and penetrates deep with the carpets. Filtration soiling is also common in commercial settings. If the filtration system is not working properly, warm air would settle on the cool carpeted flooring. The lines are formed on the areas under the furniture or doors. The oily buildup on the soiled carpets is difficult to clean by ordinary cleaning methods. Professional carpet cleaning is required to revitalize the carpets. 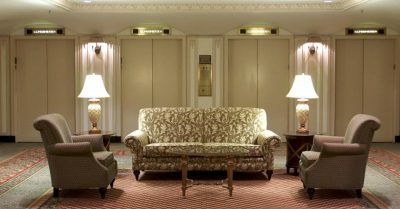 Fading is another common problem that the hotel lobby carpets will have to endure if they are not properly maintained. The ideal way to deal with fading is to keep them out of direct sunlight. To protect the carpeting and furniture from fading make sure thick curtains or blinds are installed. But, you will have to take special care to keep the lighting inside the hotel lobby optimum. However, it is also favorable to procure fade resistant commercial carpets. If you are facing carpet problems at your hospitality venues, it is absolutely necessary that you hire a professional company to resolve them. Hotel lobby carpets enhance the environment and should be in best condition always. Extra Hands Cleaning Services have trained technicians who make use of specialized methods for commercial carpet cleaning. So, pick up your phones and call at 816-396-6234 to eliminate the common carpet issues.